The “Franziskusweg” on Krk is a long distance hiking way. 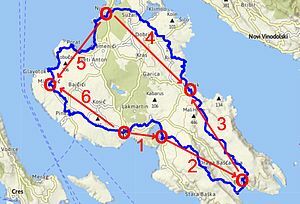 The hiking way leads around the island of Krk in 6 stages (complete 100 km and 3200 hm). The 4 name giving monasteries of the Franziskus order are located along the track in Krk, Kosljun, Porat and Glavotok. The track is created in a way that it mostly leads along ways without traffic. Fascinating are the different impressions of the stages - the hiker dives each day into a new world, one time almost alpine, than walking through the woods and another time along the sea. We recommend holding the impressions tight in a walking diary. Different to other long distance walks the accommodation is located at a central point, at the city of Krk. The daily stages are reached with public buses, starting at the city of Krk. The stages are to be walked counterclockwise, the stages 4 and 6 are an exception, these need to be walked clockwise (has to do with the bus schedules). In case a hiking group comes with its own bus, this group is more flexible and independent of the schedule of the public bus network. 4-day routes in the north- or in the south area of the island for everyone who has planned only a short vacation. The south route consists of the stages 1, 2, 3 and the connection stage from Krk to Vrbnik. The north route consists of the stages 4, 5, 6 and the connection stage from Krk to Vrbnik. Is it possible to drive the Franziskusweg with the bike? In a little modified form both, the north- and the south route (each almost 60 km) can be driven with a mountain bike as a day stage. The south route is technically and conditionally very demanding because of the track section from Stara Baska to Baska (only for experienced bikers). The north route requires also good condition, however, technical wise it is easier to drive. To walk 100 km a week is for experienced hikers no problem at all (my father walked the Franziskusweg with an age of 78 years). Unpracticed hikers shouldn't try any long distance walking way. The general walking speed is about 4 km/h, that makes about 5-6 hours walking time per day, including brakes in total up to 8 hours. The in average 550 height meters per stage are, compared to tracks in the Alps rather moderate. There are only 200 m steep down on the 2nd stage, at the way down from the plateau to Baska. Who does not like to walk down a steep trail, can also change the direction of this stage and might feel saver by walking it up. Windcheater, hood and thin gloves can be recommended at Bora (cold north-east wind) on the plateaus in the south (stages 2 & 3). In general it doesn't need heavy alpine boots, light trekking shoes with a good sole are OK. Walking sticks are a matter of taste. Pack a day rucksack with clothes and provisions. All stages are available on this home page as GPX files (to be downloaded). There is a detailed description for GPX newcomers to this in the menu item "orientation". Additionally you can find here detailed maps for every single day stage as PDF to print out, as well as one video per day stage for preparation purpose. With the car, or alternative - from the end of May by the middle of September overnight with an overnight bus (Fr/Sa) of Blaguss (W/NÖ/STM) or Sabtours (OÖ/S) to the hotel Koralj. All year long - with “Eurolines” from Vienna to Zagreb and with ”Autotrans” from Zagreb to Krk (bus station), or from June until September with “Eurolines from Vienna/Graz to Rijeka and “Autotrans” from Rijeka to Krk (bus station). Tastes are different, the city of Krk offers a variety of accommodations over a breakfast pension up to the ****Hotel with half-board. The prices are seasonally differently high, I recommend avoiding the expensive and hot months July and August for long distance walking.